Airtherm are pleased to announce the appointment of Carl Gipson who joins our vibrant and enthusiastic team of individuals, in the capacity of ‘Area Sales Agent’. Carl will cover the Oxford, Buckinghamshire, Berkshire, Yorkshire & Humberside areas. 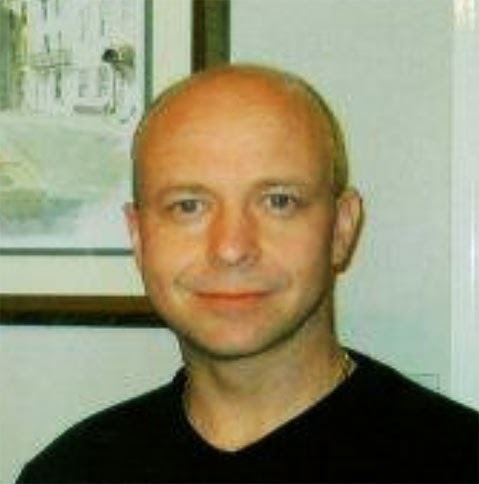 Carl has over 30 years technical sales experience in the commercial and industrial ventilation sector. He has worked for some well-known blue chip companies in the industry and will be a welcome addition to the company. Andrew Brown, Director of Airtherm Engineering Limited, said “Carl is a perfect individual to join our team, he has a great wealth of experience, knowledge and understanding of the ventilation product sector. If you have any enquiries in these locations, or others, please call our office on 0844 809 2509 or email sales@airtherm.co.uk to arrange a meeting. 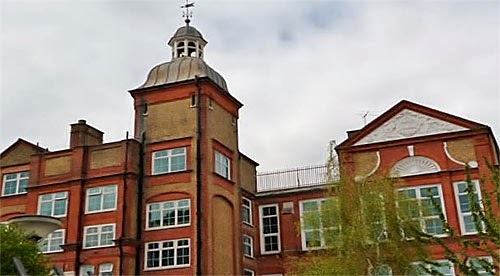 Airtherm worked closely with the contractor AC Preou Limited with the supply and installation of two boiler house refurbishments of Reay House and Oak House at Lambeth Hospital, London. The existing plant was removed by the contractor and replaced with a more modern, efficient system supplied by Ideal commercial. 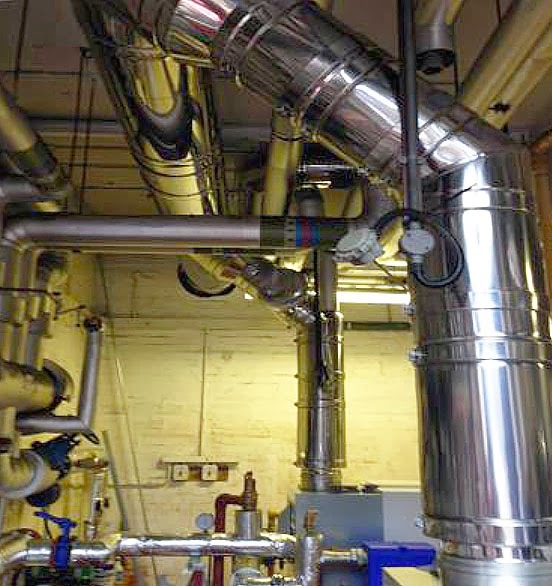 Airtherm installed both flue systems simultaneously and completed the works within two working days to meet with the client's schedule of works. 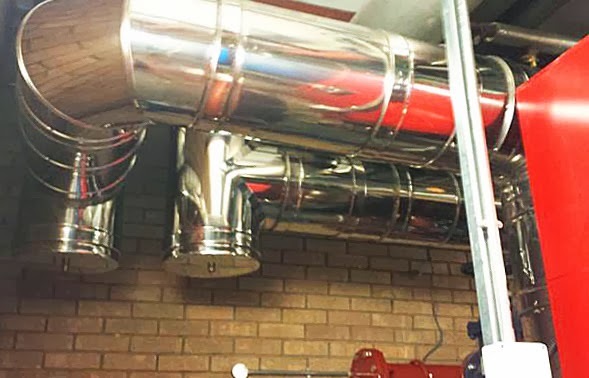 Airtherm have recently designed, supplied and installed a complete twin wall stainless steel flue system serving each Hamworthy Fleet 350 condensing boiler at Trinity Catholic School, Leamington Spa, Warwickshire. Trinity Catholic School is a mixed Catholic secondary school in Leamington Spa, Warwickshire, England. The school had Technology College status awarded in 2000 and Arts College status awarded in 2004 and had been awarded Artsmark Gold award. 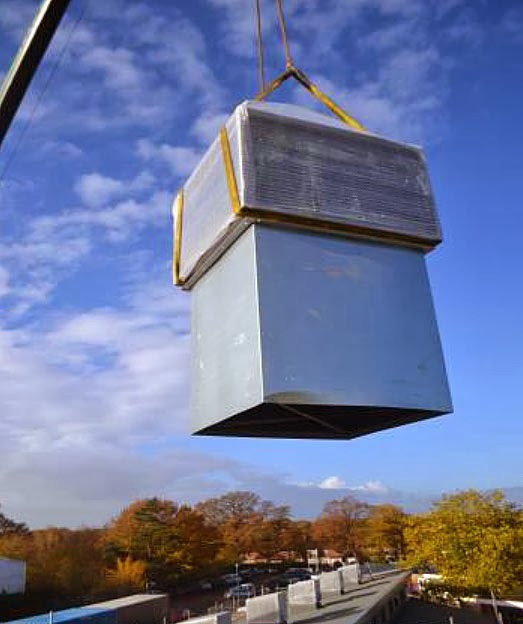 The existing Hamworthy Purewell 120 boilers were removed by the contractor during the School summer shut-down, working on a tight program the new boilers were installed followed by the installation of our flue system. Airtherm Engineering Ltd only uses branded products which are synonymous with the highest quality - and it is this reputation that enables specifiers and contractors to use our versatile product range with total confidence. 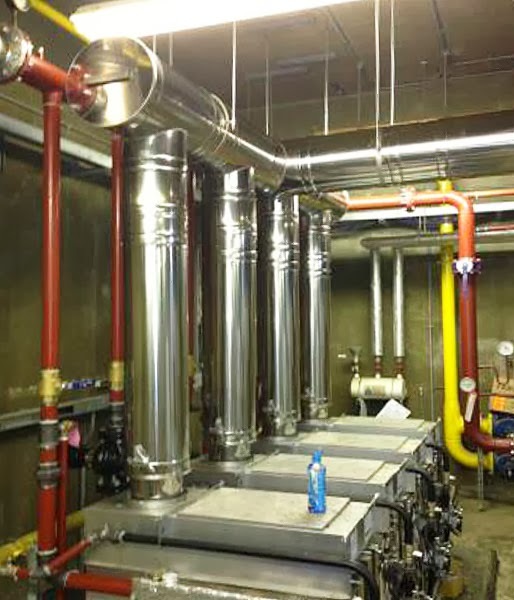 This project involved the removal of the existing twin wall header system and the installation of a new twin wall four hour fire rated system to serve two MHS Ultragas condensing boilers. Airtherm had to undertake a CCTV survey to establish to condition of the existing chimney and to ensure the new liner would pass down the stack without any obstruction. The existing 24m high brick built chimney is lined throughout with our single wall fully welded product suitable for the application. Our experience team of fitting engineers used a chain block to lower the sections down the stack until reaching the base, completed using a top stub termination cowl and flashing plate. Airtherm have already completed the 1st phase works by installing two ‘Wind-iVent’ Systems to the newly completed single storey class rooms. 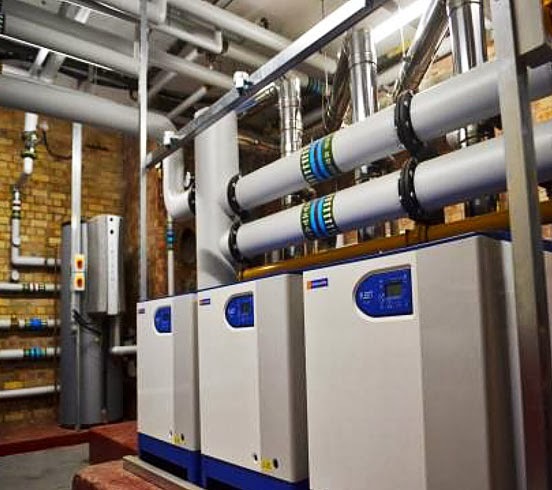 The 2nd phase fix features a further six 1.2msq units for the Hall area, which will be used mostly by the Church, and a further six 1.1msq units serving the Classrooms. 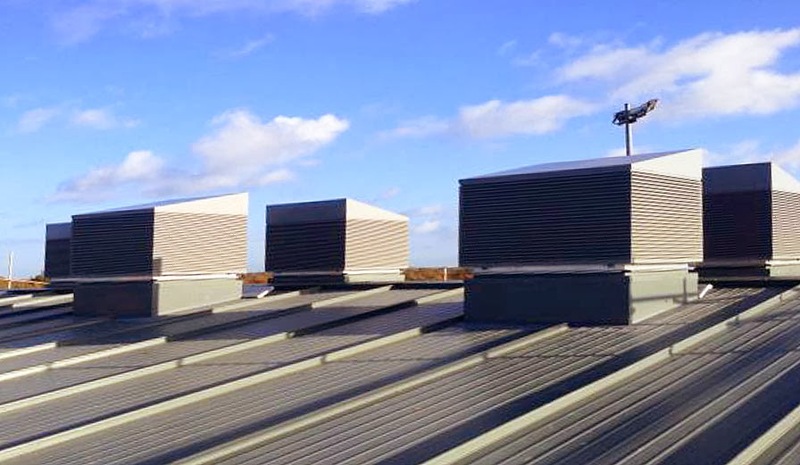 The new installation of fourteen natural ventilation systems for MVS Limited had been designed and carefully selected from the room data sheets provided, ensuring adequate ventilation rates for the pupils at Coppice Primary School. The natural ventilation systems have been designed in line with all current publications such as CIBSE guidelines, AM10 Natural Ventilation in commercial buildings and Building Bulletin 101. The terminal sizes have been selected by our new computer aided software ‘Wind-iCalc’ and fully conforms to the CIBSE requirements. The Airtherm “Wind-iVent” Class ‘A’ is a natural ventilation system operating on established aerodynamic principles. As external wind flows around the terminal itself, positive and negative pressure areas are generated. On the positive side air enters the louvres of the terminal and is directed down through the internal vanes into the room below allowing a fresh air supply to be delivered, and on the negative side the stack draws the stale unwanted air which is expelled through the terminal into the atmosphere. The units are be manufactured in accordance with BS EN ISO 9001, and to suit the architectural and design parameters as indicated in the design specification and drawings. Internal airways are to be protected by incorporating anti-bird mesh to the terminal louvers. Our systems can be manufactured to achieve 99.8% effectiveness (class A) when tested with a simulate rainfall of 75mm/hour and wind speed of 15m/sec based on a free area of 55%. Units can be installed on almost every roof including flat, pitched and even on the roof apex where appropriate. The roof fabric of commercial applications has bearing on the openings and roof plates that are required to install the systems competently. We offer a roof plate solution for all situations, including self mount flashings and curb mount flashings with suitable upstands. Airtherm Engineering's track record of successful and efficient projects was demonstrated by the recent installation of our 'Can-iVent' island kitchen canopy system at Colegrave Primary School in Newham, London. 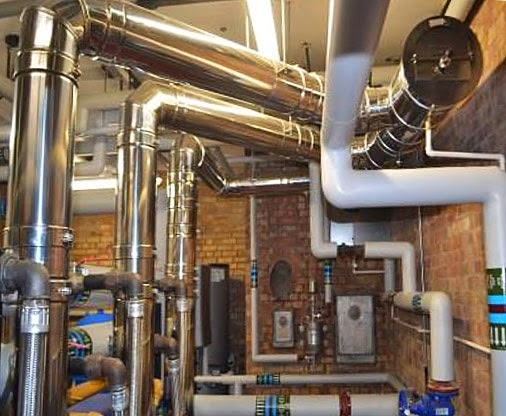 The project involved the successful liaising between Fowler Martin, AC Preou Limited and Newham Council (consultant, contractor and client, respectively). The units are designed and manufactured to deal with a wide ranging and varied commercial application and can deal with humidity, condense rich, as well as hot and greasy environments. The island kitchen canopy was fitted with a R102 Ansul fire suppression system which conforms to NFPA standards 17, 17a and 96 and is UL300 listed by Underwriters Laboratories, Inc . 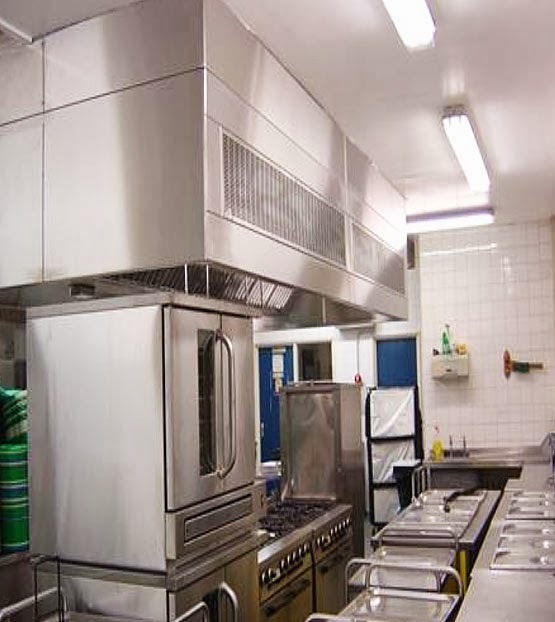 The system was supplied with nozzles, detectors, cartridges, liquid agent, fusible links, pulley tress and elbows as required for the specific commercial kitchen application at Colegrave Primary School, Newham, London. Area Sales Engineer Jim Keady initially liaised with both the consultant and the contractor at the early design stage to establish the full requirements for this project. Airtherm then attended site to complete a survey and based upon our findings a full specification and design proposal was issued to the consultant for consideration. Airtherm were specified by Screen & Partners to carry out the works in conjunction with the nominated contractor Kirkland (Blyth) Limited. 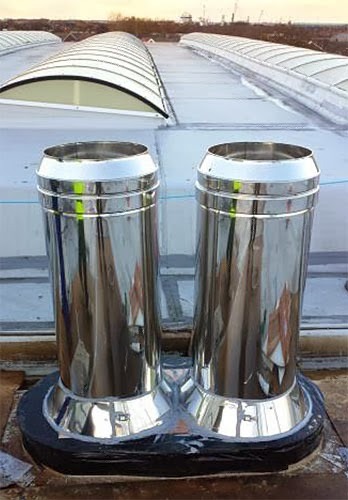 The recent completion of the two twin wall flue systems ran smoothly from start to finish with the client commending our installers: “We would definitely be using Airtherm again in the near future”.